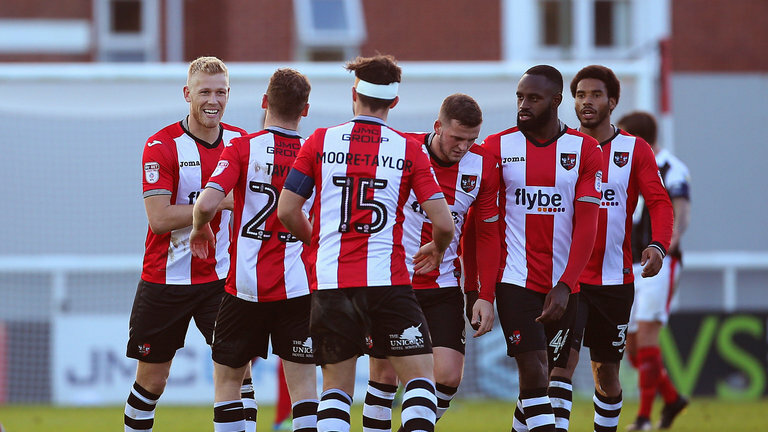 EXETER welcome Lincoln for the second leg of their League Two play-off semi-final on Thursday night. Thomas Thorn (@TomTomDRFC) offers his analysis and betting insight. These two teams faced each other just five days ago and there was nothing to separate the teams; if the rest of the playo-ffs are anything to go by, the second leg will be just as cagey. Lincoln had the better of the second half with Exeter’s Jayden Stockley having the best chance of the opening 45 minutes. No team could find a breakthrough and the game ended goalless. Lincoln will be looking to reach Wembley for the second time this year but also achieve a second successive promotion. Exeter are hoping to go one better this year following play-off heartbreak last year at the hands of Blackpool. The Grecians will be hoping that their home form can get them through the tricky test and take them back to the home of football. Stockley has been Exeter’s top goalscorer this year and although he miss-kicked from close range in the first leg to miss an excellent opportunity, the striker will be hoping to fire his team to victory. The hot-shot is 9/5 with PaddyPower to get on the scoresheet. With the game being a one game shootout and the first leg being so tight, the final minutes of the game are sure to be dramatic. Going into the last 10 minutes of the game, if a team is winning 1-0, the other team will push for an equaliser with it being their last hope. This leaves the losing team susceptible to the counter. A goal in the last 15 minutes is 11/8 with Betway.